I have had this app for a little over a year and after this update it says my email is unknown and refuses to let me get any of my purchases. The update is utter crap. It's just confusing when it was perfect the way it is before. Not that I'll have time to really work with it since I've been ripped off and lost everything. Utter crap. I can't update the latest update, because of the new version! I'm sick and tired of having to see the stupid icon that reads "Must update to 7.0 in order to download!"! Customer support actually responded to help requests. So far I have bought a comic book which I can't read and there are no instructions for and nobody responds to email. What an improvement – I’m really liking the new interface, regular updates, and overall functionality since the update. Good work! I'm really liking the new store layout along with the interface. So far my old purchases have transferred fine and the added sound and camera style effects in Motion Books leads to a much better experience. This version of the app removes a feature which shows each frame of your comic in succession. It makes viewing little better than reading a PDF. I suggest you wait to update or you will be sorry. I lost all of my books to a previous update. I did get them restored with help from Tech support, I think. Unfortunately the UI is so poorly done that I cannot tell what I have or don't. Additionally, the store is difficult to navigate and the layout of the titles has no rhyme or reason to identify order or release date on series with multiple titles. Overall, I'd say stick to the paper comics as this app might only confuse and anger you. Improved flow and design. One star off for losing guided view. The older version was great. Why mess with it? New version would not recognize my registered e-mail. Your purchases will not load automatically. You have to restore everything. Browsing is confusing. Menu and settings useless. Guided view is gone. You have to dig through settings just to find the "Sign-in" screen. Not user friendly! Give us the old version back! Keep moving forward. Rating is stupid. Things will get better, but you gotta start somewhere. So glad they switched from comixology. Much better user experience. Loving this. The motion comic versions are very cool. Just the version of Harlan Ellison's Star Trek story was enough to convince me. The rest of the library is just extra great. This app is a great way to get into digital comics. The zoom works great and I really like the motion books effect! The support is great, but I wish I didn't have to reach out so often. New and crispy. I likey. The new app is beyond terrible. I thought the loss of guided view was a bug, but I guess it's just the new downgrade. Time to delete.. Do not purchase comics thru this new app thinking that you’ll read them in Comixology with guided view. Content moving forward will not sync up. This app is awesome. 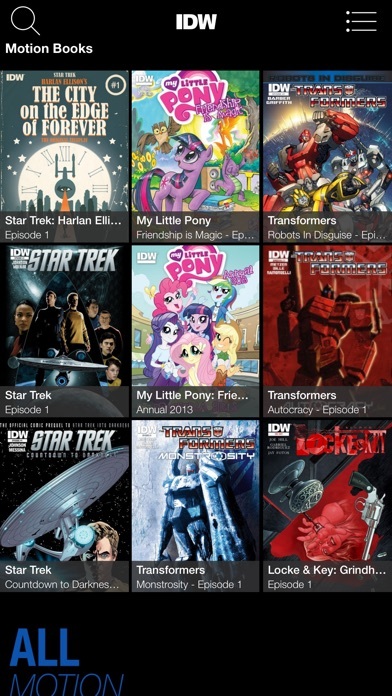 I really wish I knew that idw had an app earlier. Now I can read all the issues before they're available on Amazon :D I really don't have anything negative to say here. Its not the best app it could be but I'm not the one to ask for criticism. Overall it's great. JUST GET IT. Any reviews that end in! Or end in a :-) seem to be very generic and clearly made by people who never read comic books. I own now thousands of comics, I love the IDW comics, I buy them faithfully, however I have not bought a comic book using this application since the upgrades. is very difficult to do so, even if i had liked the interface. Instead I buy them on the other applications or websites Bad call from IDW launching this new version of the application without better testing with the target customer first. Worse call from the developers posting fake reviews. One of the fake reviewers (german chaos) even says “the app is great and the people behind are even better!”? Who writes that? Currently they need to work on renaming/organizing comics to make it less confusing, finding a more friendly interface. announce that you are sorry is not working out and that you are working on it and adjust the tone of the fake reviewers to make them more realistic. Love the motion books through Airplay on my Apple TV. So dang cool. For some reason they change the out look to this huge mess. I want the old look! It's been awhile since I logged on, but my email address is no longer recognized as an account. All of the comic books books I purchased over the years are now missing, gone, unavailable to me. I've been ripped off! Slick, easy to use and intuitive. Fun to use even for an old comic geek like me! 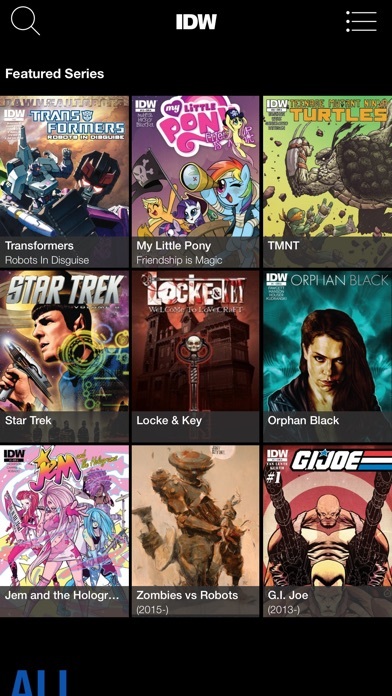 I love comic books and this app satisfies my taste. Comixology is really to blame for cutting off more and more of their apps from direct iTunes purchasing. As a result we have IDW using madefire and this mess of a format. Guided view GONE. Many of my past purchases GONE. For now I'll be sticking with reading my older purchases on the Comixology app, but I am getting really sick these regular changes. Can you please add something similar to the Guided View option that Comixology has to make reading the graphic novels I bought easier? Even with an iPhone 6s+ it's a chore to read them. This gets better with each update. All my books are finally back in place, and I like the way the covers and art are big and bright. The thing I want most now is that the books in the cloud were easier to sort through. Too many zombies needs more Transformers. Just gonna use the Transformers Comics app from the same company instead. Would be nice if there was a bundle deal for all of the comics on that other app though, I'm super behind. As in I'm basically still on the classic #1-4 from when I was like six years old. I do think I got to read something newer in the world at some point at a friend's house though, hmm. 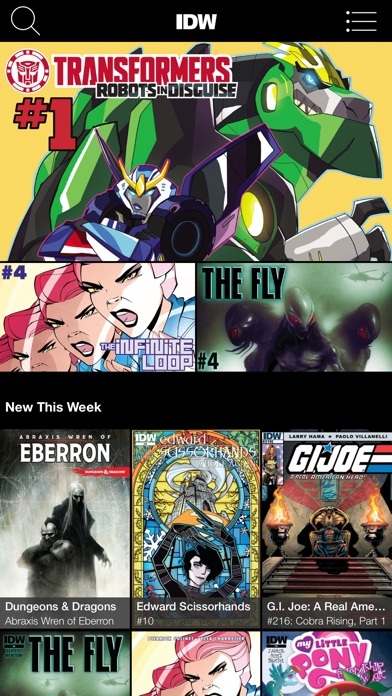 I really enjoy exploring the IDW app. I look forward to the future. Great stuff here. Good to see this continuing to get better. I have appreciated the updates. It made it easier for me to read my comics. I use this app to read my comics because I am handicap and missing my dominant hand and being half blind it only makes sense to use it. Without guided view it makes comics harder and less enjoyable for me again... Edit... Since the new updates when I close the app I now have to find my place again why won't it hold my place? Awesome App and Great Comics! 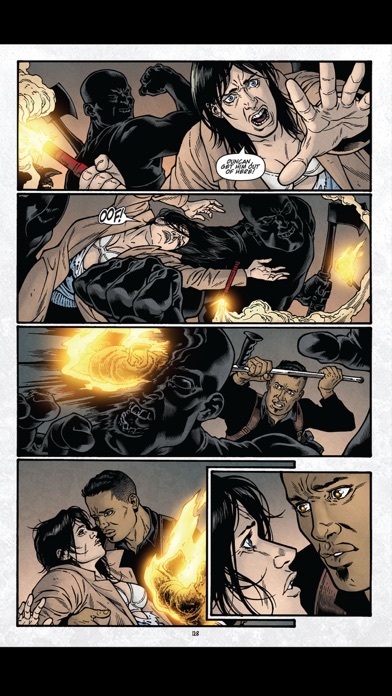 I love all the Ghostbusters comics! I'm a huge fan and can't wait for the newest issues! This is so frustrating. First I had to create a "New" account, then I get locked out of said " New" account, when I "log in" I get a spinning wheel of death saying configuring. Too bad, it's Wednesday, I planned on spending money. Oh well. I was really disappointed with this update . The way the comics are organized could be far better , some of my comics that I bought from the older update got deleted , and just the design of the menus , etc . could use improvement . There are motion comics ( however this would be a great edition if you had the option to turn it off . One good thing however with this app is that you get some free comics but even with that I was still disappointed. I think I'd rather read a physical copy of some comics instead . Also there is no panel to panel scrolling like in previous version which is my biggest complaint about the app overall . Without panel to panel scrolling it makes it hard to enjoy reading a comic . Really disappointed. If fixed I will rate a higher amount of stars to this app but for now 2 . Excited to have my favorites in one place. Love finding old favorites in the store. Visual discovery is sweet...I like sweet. Motion Books look pretty cool. I'm in Hong Kong reading GI Joe - hope China doesn't censor me! All this beats the old version....especially if we get more titles with MOTION. 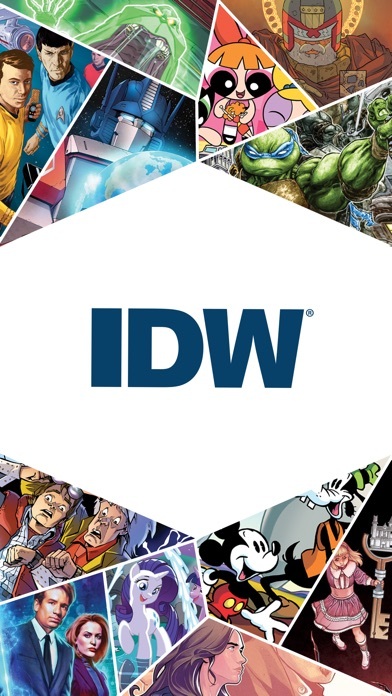 Thanks IDW for moving forward. It was perfectly functional before. Why they got rid of that feature is beyond me. For some odd reason and this happened suddenly yesterday or the day before for me but I keep getting error each time the comic loads, at first I thought it was me but all my other friends said The same thing is happening to them too, its with every single comic not just one, Please fix the app please! This version definitely looks and feels better. I'm Happy there's lots of content to browse! You guys are awesome and would like info on how to link up and create with artist on a couple of ideas. Every comic looks and reads different. I won't lie: IDW is becoming one of my favorite comic publications. That's the reason I bought this app. Having said that, however, there are some changes that need to be made. It'd be nice if the page fit the screen. Having to blow the page up while reading takes away part of the experience. Plus, better organization when looking for titles would be helpful as well. Another complaint is that pages are missing from my restored purchases. I don't know what happened, but it's a problem that needs to be resolved. All in all, it's not a bad app, but it is in need of some improvements.